Dentures are perhaps the most well-known method for replacing missing teeth. They have been around for centuries and have helped countless people to regain their ability to speak with confidence and chew their food thoroughly. Unfortunately, this treatment has gained a reputation for being inconvenient and uncomfortable — but for many people, this stereotype is far from the truth! In fact, full dentures in Fairfield have lots of positive points, and they might be just what you need to reclaim your lost smile. There are two types of dentures in Fairfield: full and partial. Whereas partial dentures are meant for individuals who have just a few missing teeth, full dentures replace an entire arch of pearly whites. Dentures may be constructed of various materials, depending on a patient’s preferences and/or budget. The teeth portion of dentures is often made of porcelain or acrylic. Both of these options mimic the appearance of natural teeth and are strong enough to help you enjoy most of your favorite foods without worrying that you’ll accidentally damage your prosthesis. The base, the portion of a denture that looks like your gums, is usually made of a special resin. It helps to secure your prosthesis in your mouth either via natural suction or with the help of a special denture adhesive. 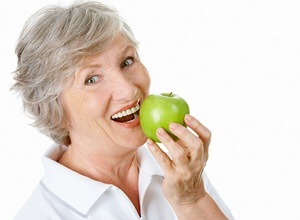 What Are the Advantages of Full Dentures? Dentures are a suitable treatment option for the majority of people who have suffered extensive tooth loss, including many folks who are not candidates for dental implants. May dental insurance companies are willing to help pay for dentures. When they fit well, dentures can be quite comfortable. You may experience a bit of soreness when you first start to wear them, but once the adjustment period is over, you can expect to feel at ease when your new teeth are in your mouth. 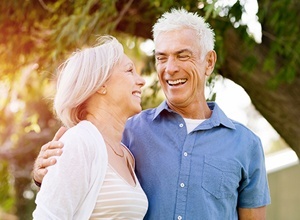 Dentures can look gorgeous — just as good (if not better than) natural teeth. They also help to keep your lips and cheeks in place so your face retains its shape. If you care for your dentures well and visit your dentist to get them adjusted periodically, they can serve you well for 5 to 8 years before you need to get them replaced. If you would like to be the proud owner of a new set of teeth, your journey begins when you visit our practice for a consultation. We’ll examine your mouth, evaluate your oral health, and recommend the tooth replacement option that is the best fit for your circumstances. 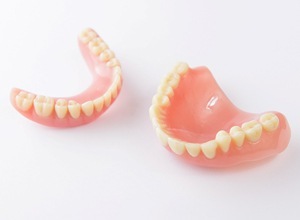 If we recommend a full denture, we might have to extract a few teeth to make room for your prosthesis. Then, after you’ve had a bit of time to heal, we’ll take some impressions of your mouth and send that information to the laboratory that will create your denture. 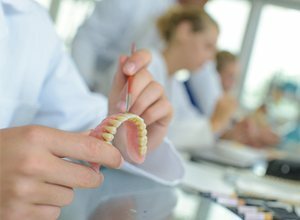 After your denture comes back to us, we’ll make any necessary adjustments to its fit and give you detailed instructions on how to get the most out of your prosthesis.